Not just a major vacation destination, Montana is a veritable melting pot of delicious grub. Add to it the wide-open spaces, outdoor living, and the riches of nature, and it's enough to make any vacationer question the decision to go home! Prepare yourself for what the authors call great, honest, and authentically hearty chow you can prepare at home,” the Montana way. 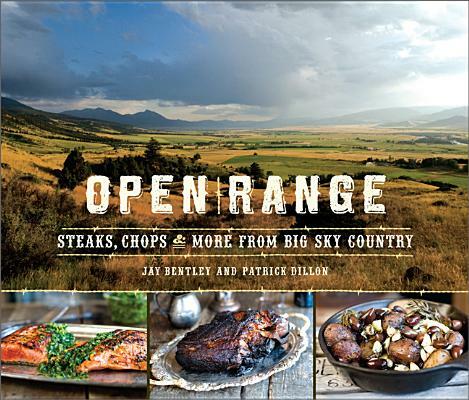 Open Range serves up generous portions of meatincluding venison, quail, duck, elk, fish, pork, and beefin near-excess, and all manner of favorite local steakhouse sides. The Mint Bar and Café in Belgrade, Montana inspired the book, but the recipes include much more than menu offerings. Far from dusty chuckwagon cuisine, Montana's culinary influences are Cajun, Creole, French, and Italian. Standouts include Fried Meat Pies, Campfire Coffee Chili, Buttermilk-Fried Quail with Steen's Syrup, Poacher's Deer Leg, and more. The authors put their considerable knowledge of meat-eating to use: beginning with how the animal was raised through all the steps of choosing, prepping, marinating, cooking, and enjoying it. Follow the main course with basic potatoes and creamed spinach to stews,salsas, greens, and desserts: you'll leave the table satisfied. Jay Bentley is the founder, owner, and operator of The Mint Bar and Café of Belgrade, Montana for over 15 years. He trained under New Orleans chef, transplanted Parisian, Daniel Bonnot, of the Louis XVI, before moving to Montana on a permanent vacation. He lives in Belgrade, Montana. Patrick Dillon is a Pulitzer Prize-winning non-fiction writer, author, and editor. He now operates a California winery.